I’m getting married in the United States. Where do I get my prenuptial agreement? The relevant jurisdiction is the one that you are living in when your relationship ends. Where you get married is irrelevant for these purposes. So, even if, for instance, you get married in New York, if you are living in Ontario when your relationship ends, you would be governed by Ontario law, and you would get an Ontario prenup. I’m going to be living in both Ontario and another country during my marriage. Will my Ontario prenup be valid in this other country? This is a question only a lawyer in the other country can answer. Even if your Ontario prenup states that all family law rights are governed by the agreement, the agreement is made pursuant to the laws of Ontario, and the jurisdiction for any adjudication related to the agreement is Ontario, a foreign court may not enforce the agreement (for many reasons – e.g. some countries simply do not enforce prenuptial agreements). What is typically done in these situations is that the international couple enters into two “mirror” prenuptial agreements – a prenup in both jurisdictions where they will be living that essentially say the same thing. That way you can be sure that regardless of which jurisdiction you live in, there is a valid prenup governing your relationship. If I get my prenup in Ontario, then move to another country, will my prenup still be valid? There is no way to prepare a prenuptial agreement that is valid internationally. If you are going to move to another country, you can’t be certain that your prenup will be valid in your new country of residence without obtaining advice from a lawyer in that country. If you were not expecting to move to this other country, you may be able to obtain a post nuptial agreement. Again, you would need to obtain advice from a lawyer in that country to determine whether this is possible. I’ve got a prenup from another country. Is this valid in Canada? Whether a foreign prenuptial agreement is valid in Canada is going to depend on a number of factors, and you will need to sit down and have an in-depth discussion with a lawyer. Some foreign prenups will be; many will not be. Being an international couple is difficult – even agreements that are valid in Canada may not have the effect that you think they will. (c) a provision in a marriage contract or cohabitation agreement respecting the right to custody of or access to children is not enforceable in Ontario. Let’s parse this provision carefully. In the first sentence, you can see right off the bat that a foreign prenup will be “governed by the proper law of the contract” – that is, by the law that the prenup says it will be governed by. So, this means that for international couples, a prenup will often be valid in Ontario. However, there are 3 exceptions set out in the statute. The first exception – A foreign prenuptial agreement will be valid and enforceable in Ontario, and subject to the laws of Ontario, if entered into in accordance with Ontario law. In other words, the prenup must be entered into in accordance with the governing statutes and case law in Ontario, which is obviously not normally the case. For instance, a Romanian prenup is likely entered into in accordance with Romanian law, and not Ontario law. This exception does not mean that the foreign prenup must comply with the entire body of Canadian law. But it must at least meet the formal requirements of Ontario law (made in writing, signed by the parties, and witnessed) and likely satisfy Ontario law requirements of consent and capacity, and likely at least take into account the general legislative scheme dealing with family law. The second exception – Even where the proper law of the contract is a foreign jurisdiction, a court can set aside provisions in prenups under section 56 or 33(4) of the Family Law Act. Let’s look at each of these in turn. Under section 56 of the Family Law Act, a court can disregard provisions in a prenup that deal with custody, access, child support, chastity, insufficient financial disclosure, lack of understanding of the agreement by one party, fraud, and duress. Under section 33(4) of the Family Law Act allows a court to disregard a provision for spousal support or a waiver of spousal support if such a provision would be unconscionable or if there was a default in payment. In short, anything that would not be enforced in an Ontario prenup will not be enforced in a foreign prenup. 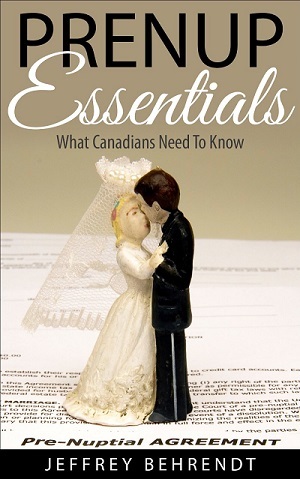 The third exception – Custody and access provisions are not enforceable in foreign prenups (just like in Ontario prenups). If you are an international couple considering a prenuptial agreement — or an Ontario couple who may move abroad during your marriage — you’re invited to call or email us. We’ll explain for free how you can protect your assets and plan your estate. You can call us toll-free at 855-PRENUP-4 or email us using our contact form here. We can help you anywhere in Ontario. My boyfriend and I are planning on getting married soon and might need a prenup in the not so distant future. We really dont have much of anything so there wouldnt be much to split! The only this is, I am from Ontario and he is from Florida. I would imagine that this would change the type of prenup we need? It is going to depend on where you intend to live. A Florida prenup would not be of much use to you in Ontario. I don’t know Florida law, but my understanding is that an Ontario prenup would not be of much use to you there. So, you need to get a prenup for the province or state in which you intend to live. Many people actually get both if they are not sure where they intend to live or where they may well start living in one place and then move to the other. @Safaa – The relevant jurisdiction is the jurisdiction you will be living in when you are married. Where you get married does not matter. Other than that, you’d follow the same process as any other couple. Things can be done via email, telephone, Skype, etc. @Stu – I’m not quite sure what you’re asking. A prenuptial agreement will be valid no matter where it is signed, so it can be signed in China. In your case, it is going to be particularly important that your fiancée receive independent legal advice from an Ontario lawyer about your agreement, ideally from a lawyer who can speak Mandarin/Cantonese with her to explain the agreement and her legal rights. If marrying your spouse from a different country , could spouse sign prenup that is sent from Ontario digitally before coming to Ontario ? @Sam – A prenup can be signed anywhere in the world, so you could email your prenup to your partner, who prints it out and signs it, then sends it to you in Ontario. I’m a anadian getting married to a Jamaican man in Jamaica in Jan 2018, I’m wanting to get a prenup drawn up and a living will to ensure I protect myself should a death or divorce occur. I want my estate to go to my daughter. I have a house and some investments and I’m trying to be proactive in case things don’t go as planned. I will be applying to bring him to Canada once we are married. Can this be done and can you help me? @Brenda – Sure. I’ll send you an email. I have some questions regarding an international prenup/ postnup. I am taking a trip to Nigeria Oct.15/17 for a little time and during my stay to visit my fiancée there ( we have been seeing each other for 2 years) we will be getting married. It will be a court wedding ( something like a justice of the peace in Ontario) . I will be going back to Canada around the middle of Nov. this year but as my fiancée is a Nigerian male he will be staying there until such time as he can come to Canada. He lives in his parents house there as is usually the custom. A wages over there are poor at best he is helping out at home as much as he can. His brother in England and myself to some degree have had to help assist the family since their father passed away a little over a year ago. I am retired from my job and receive a monthly pension and get a little extra besides that. His father left the family a house to dwell in but it was in need of renovation when they took possession. I am currently in a rental apartment but hoping to move into a house here once he has emigrated to Canada. I don’t know if there would be anything to contest if anything happened to either of us. I have one child but she is grown and he has no children as yet. My pension is set up that if I was not married by the time I retired I cannot designate a future husband as a beneficiary of my pension . And at the time of my retirement I designated it to my daughter but she will only get it for 10 years and then it dies. So after I get married (my daughters dad died when she was young) again I just would like to specify in a prenup (or postnup)that I cannot be entitled to anything he has before he gets to Canada to live , ( in case of death or separation) and he cannot be entitled to anything of mine (unless I state it in my will) before he gets to Canada (even though we are married in Nigeria legally). Do you think I even need one? I guess its just a CYA document to make sure we are on the same page so to speak. Sorry this is a bit lengthy. @Maureen. You may be correct, but it is difficult to tell without more information. Essentially, if a relationship ends, Ontario law shares equally both parties’ increases in wealth during the marriage. From what you are stating, your wealth will go down during the marriage, as your pension pays out and you live on your savings. So there may well be no increase in wealth during the marriage for you to share. If you are certain that’s the case, or at least very likely to be the case, then a prenup would not be appropriate in your case. I am going to marry again and wanted to protect leftover (house, RRSP and INC.) from first marriage. My future wife is from Morocco. She is leaving in Morocco. I am going there and get marry. She can’t come to canada untill I married and sponsor her. Please advise me how I can start the prenups process why it is taking 3 moths. is there any faster way to compelet the process. (iii) you may wish to sign the prenup after your marriage. It is best to speak with a lawyer to decide which option is best in your situation.